Thinking about Detroit conjures up certain ideas for most: urban decay, financial decline, the auto industry, crime, and poverty. A certain image accompanies those ideas, abandoned factories, apartment complexes, trash in the streets. With this image in my head, I was completely surprised by what I found in Detroit when I travelled there for this project. There are certainly an abundance of abandoned industrial buildings, but the majority of urban decay in Detroit was in reality extremely suburban. Detroit is not a city like New York or Chicago, it is a city designed around the car, and it is remarkable in its sprawling nature. The houses in this sampling of photographs where all taken inside the city limits of Detroit, in neighborhoods just outside of the city’s small urban center. Each house is somewhere in the process of abandonment that begins when homes are vacated or foreclosed upon and then are unable to be sold or rented to new residents. Some homes are boarded up and maintained by neighbors, while others in more thoroughly emptied parts of the city have been ransacked and are beginning to be reclaimed by the natural surroundings. 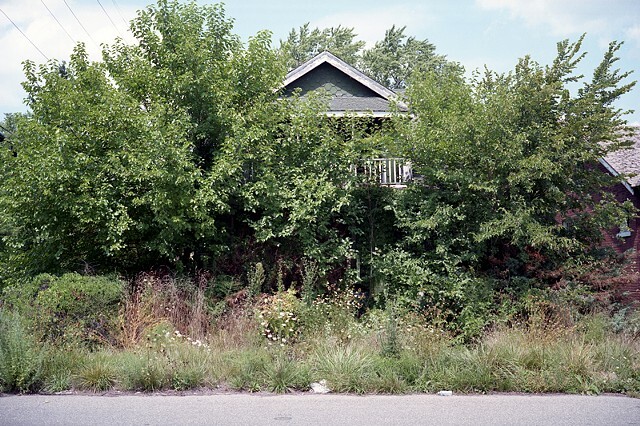 Parts of the city have a surprisingly rural feel to them, especially in places where many homes have been demolished. I have chosen a variety of photographs that display these different stages of decay and reclamation.